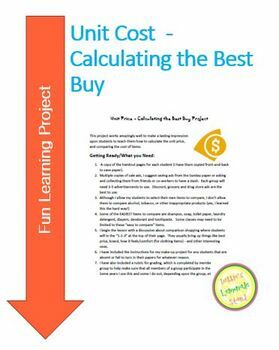 This group project is fun, and solidifies the concept of Unit Price/Calculating the Best Buy into a student's skillset better than any other activity I have used. It is designed to last 2-3 50-minute class periods but I left it in Microsoft Word format so that you can easily edit it to meet your needs. This could be done individually, but is designed to be done in small groups of 3-4 students. 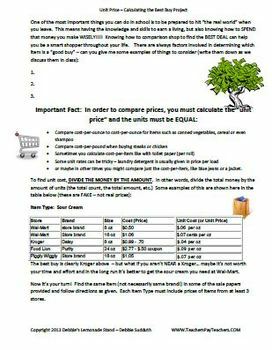 After some instruction, students are required to find actual items in sale advertisements and compare prices to find the "best buy" for the selected items.